Wise homeowners will ensure that their air conditioner is in top working order for that first warm day. By following the five tips below, you can be ready when summer weather hits and set yourself up for energy-efficient and cost-effective cooling all summer long. If you want to know how to get rid of allergies this spring, you can begin by simply replacing the furnace filter on your HVAC system. As every allergy-sufferer knows, spring brings ample amounts of pollen and other airborne allergens. Remove these seasonal allergens from your home with a brand new furnace filter. If your air conditioning unit employs additional air filters of any kind, you should replace each of these as well. There’s no telling what has settled on them over the long winter months! Leaking ducts and missing insulation on your HVAC system will have your air conditioner working overtime. A professional technician can insure that your ducts are airtight and well insulated, leading you to cheaper monthly utility bills throughout the summer. Hate warm spots in your otherwise cool home? An optimized duct system will ensure that each corner of each room has an even and comfortable temperature. Although a new furnace filter can work wonders in terms of the overall air quality of your home, the dirt that already rests within your duct system can quickly clog it. For this reason, experts recommend scheduling professional duct cleaning every five to seven years. Homeowners should also ensure that all indoor and outdoor air conditioning equipment/infrastructure is completely free of dirt and debris. When it comes to outdoor air conditioning units, you must also protect against invading plants and pests that may cause unexpected damage. Keep grass and weeds away from all vents and call a pest control specialist to handle any insect/animal intruder. When you’re at work or outside in the summer sunshine, you simply don’t need to cool an empty house. Stop running your air conditioner constantly by installing a programmable thermostat. Unlike traditional thermostats that must be set by hand, this device incorporates a timer that can trigger a new temperate setting for each hour of the day and night. It even knows the difference between a Wednesday (when you’re hard at work) and a Saturday (when you’re relaxing around the house). To get the most out of your HVAC system, you should schedule professional maintenance visits at least twice a year. For all of the reasons detailed above, spring is an ideal time for one of these visits. In addition to inspecting, cleaning, and/or repairing your ducts, you can ensure that all components of your air conditioner are in perfect working order. And a trained HVAC technician can also install that programmable thermostat you’ve been considering! NexGen Air provides comprehensive HVAC services for both residential and business clients. 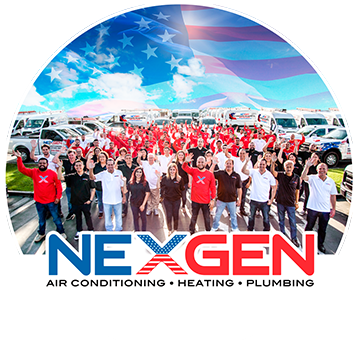 Schedule your seasonal tune-up with NexGen Air today before spring has sprung!